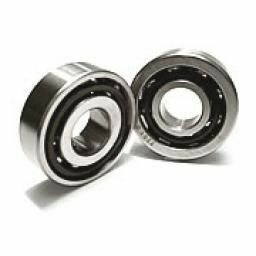 These are rigid and non-separable radial bearings especially suited to high-speed application which require both radial and thrust forces including combined loads and tilting motion. They can only accept thrust in one direction and thus must be used in pairs where a shaft adjustment is required in both directions. Available with varying degrees of “contact angle” – the greater the angle the higher the thrust load capacity. Also available in double row angular contact.